Culinary Adventures of a Poor Student: Movies and... Take 3! Harriet, I hope you feel guilty. Not really of course, but it is quite funny. So our last night and Cam and I thought it would be fun to have a movie night. Quite a few people couldn't come actually, I'm just picking on Harriet! There is, in fact, another story behind these cupcakes though, more than just movie snacks and something to leave the family for when they got home the next day. Alex and I were watching Two Broke Girls the other day, which is such a funny TV show. One of the main characters, Max, is really good at making cupcakes. 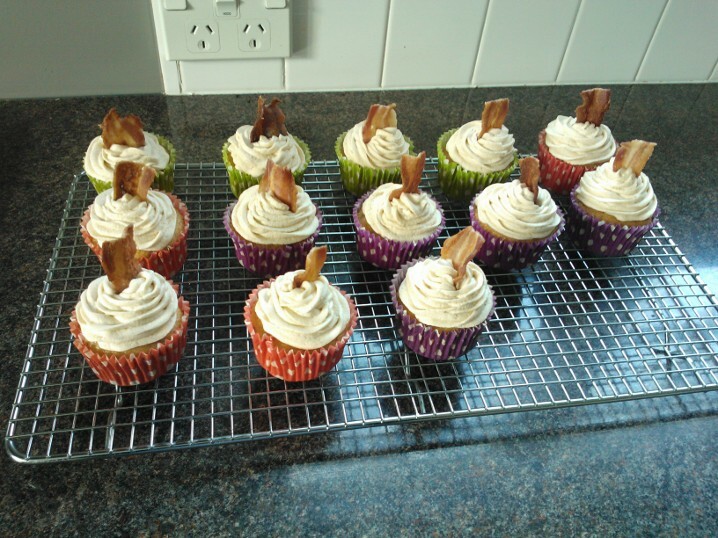 On this one episode she made these very intriguing sounding cupcakes: Beer Batter Maple Bacon Cupcakes. Now, I was a little hesitant on using a beer batter recipe as I just really don't like beer. But maple bacon... I just couldn't get them out of my head! So searching through many, many food blogs I came across a recipe that I thought sounded really good from CarlyKlock. So I made it. And it was AMAZING. It sounds weird. 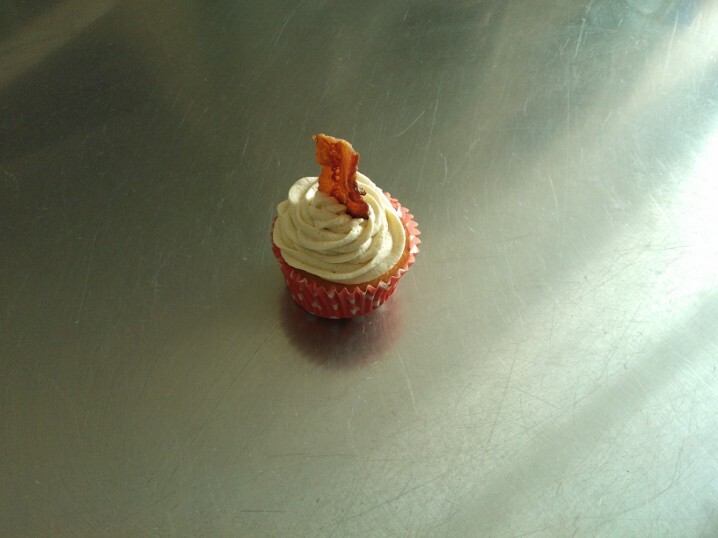 Bacon cut up in a cupcake? But it's like a lazy Sunday breakfast... In a cupcake. 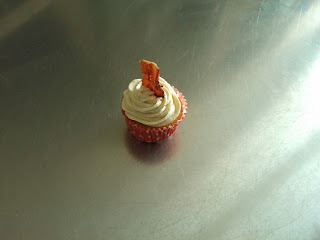 I would highly recommend these cupcakes, especially if you love bacon. Preheat oven to 190°. Place a cooling rack on a rimmed baking sheet and lay the bacon strips on the rack in one even layer. Bake for about 15-20 minutes, turning once. Turn the strips out onto paper towels when done and set aside to cool. Cut a couple of strips of bacon into 2-3cm pieces, to be used as a garnish. Finely chop the remaining bacon (about 1/2 cup or less). Turn oven down to 180°C. Sift flour, baking powder, cinnamon, nutmeg and salt into a small bowl. In a large bowl or a stand mixer fitted with the paddle attachment, beat together butter, sugar and eggs on medium-high speed until light and fluffy. Add the maple and vanilla extracts (or syrup). With the mixer running at medium speed, alternately add in flour mixture (3 additions) and milk (2 additions), starting with the flour mixture; beat until smooth. Fold in chopped bacon until evenly distributed. Scoop batter into muffin tin lined with paper cupcake liners. These cupcakes don't rise as much, so they can be filled a bit fuller. Bake 22-25 minutes, rotating halfway through baking. After passing the skewer test, keep baking until the tops turn golden brown. Let cool completely before icing. In a bowl with an electric mixer or stand mixer fitted with the paddle attachment, beat butter and cream cheese until light and fluffy. Add maple syrup, vanilla, maple extract (or syrup) and salt, and beat until fully incorporated. Add confectioner's sugar, one half cup at a time until reaching desired consistency. Beat until smooth and fluffy, about 5 minutes. Frost or pipe onto cooled cupcakes. Garnish with inch-long bacon pieces.